Mental Health is a highly relevant topic, and increasing numbers of mental disorders are being documented in schools. While most youth are physically and emotionally healthy, increasing numbers of young people experience emotional, mental, or behavioral disorders, and suicide rates are on the rise. 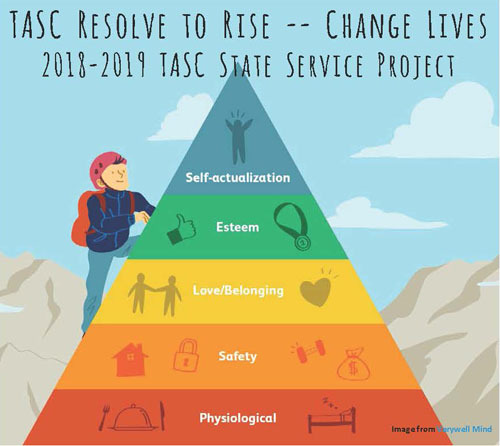 TASC challenges you to Resolve to Rise - Change Lives as we work to meet the challenge of mental wellness in our schools. Maslow’s hierarchy of needs is a well-accepted theory about the needs that motivate human behavior. Let’s climb this mountain together and empower students in our schools to reach their full potential. At least 300,000 people will be reached through projects, social media, presentations, flyers, etc. Ready to climb? We all must start at the base of the mountain.